FINALLY DONE! *looks like a wreck* I've been working on this wallpaper for a bit over a week and I love how it turned out. All the images were used was from chapter 59 inspired by this little quote from the same chapter: "The moon in the sky is white... but the moon reflected on the water's surface is black." So that was my theme, the world Allen Walker sees is black and white - the world of humans and akumas. Yes I vectored everything (but the allen scans), all those weird looking tree, the gorwing ice, redid the stars, added in clouds and vectored those darn buidlings ;A; I think I was insaned when I vectored even the grains of black that didn't really needed to be done. Before anyone says I didn't follow the rules about characters, I have only one thing to say to you: FULL VIEW PLEASE.... AND SQUINT! All critique, comments and flaming are welcomed =D It's not my greatest wall but it was fun nonetheless ^^ Enjoy! 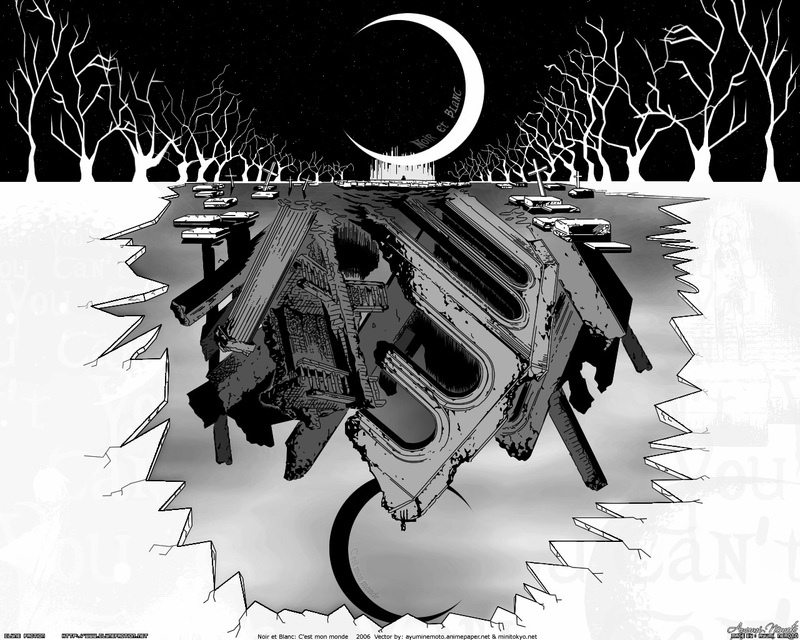 Well, I'm not familiar with D Gray-man... but I still think it's a cool wallpaper, love the black and white. It's really clean... I just love the contrast. So simple, and yet, so complex at the same time. I like the concept too. Just a thing, maybe the cracks in the ice, or whatever that is, should be a bit longer, and less shallow... Great job! I love the concept =) The perspective is kinda weird though. A view of the world that is a color of animation is good, but a view of the world that is monochrome of comics is attractive. *squints* I couldn't tell what the hell was going on in the thumbnail so I just had to download it LOL. However I think the idea is really cool ahahah and original so props to you, cool wallie. so creepy and dark and eerie ... but great! Well done! :) Thanks for sharing and keep up the fantastic work. i especially love the black with the moon and the trees - very interesting composition and very clean. Oh my........... This is a-m-a-z-i-n-g. It's just... incredible ^^. KEEP IT UPPP! The hell, this is so cool! A different view from what we see in the series, where Lenelee keeps having nightmares in this scene. Good insight. Cool wall. Love the colors and background. Great job on the vectoring and like odelya said, the emphasis on the curse mark is wonderfully done. Thanks for sharing! wow this is so awesomee! those dreams and suchh were so cool and mysterious O_O thanks for this!